This board is for sale! Discontinued as of March 2011. See bottom of page for support information. Board size: 3.5" x 4.0", with 4 holes for 6-32 screws; a set of 4 1/4" standoffs are provided. There are 3 holes at the corners and one near the bottom right, at 2.49" x 0.16" relative to lower left corner. 48 channels with one small board! No more compromises due to not having as many channels as you really want. Each channel provides 20mA (can be adjusted for 10 to 80mA - just ask) of current-controlled switching. No external current limiting resistors needed. Hook up your LED(s) and go. 4096 levels of dimming at a pulse-width-modulation (PWM) refresh rate of 1200Hz. This allows smooth fade up & down from black with no flicker ever! DMX ID settable 1-511 via DIP switch, changes are immediate, status LED blinks orange to acknowledge setting change. 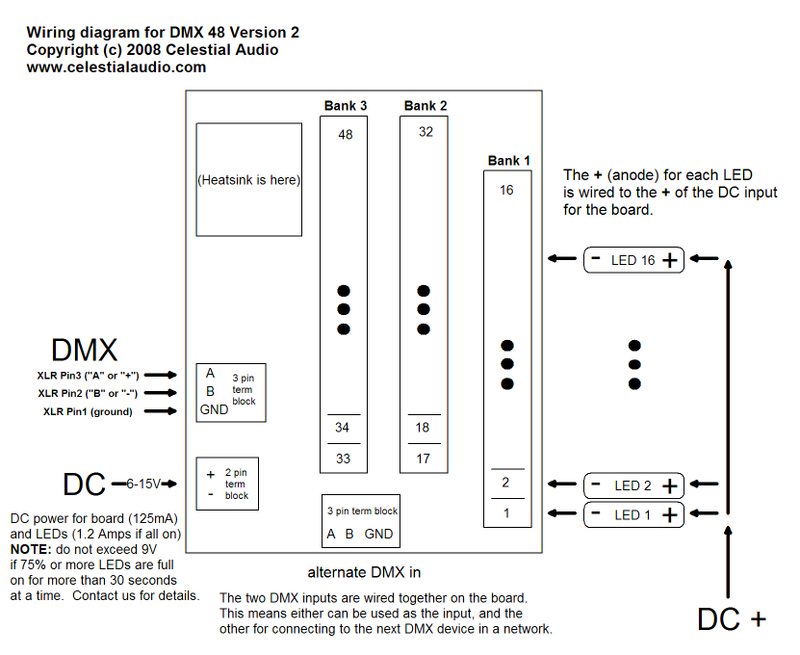 This is the starting DMX channel the board responds to; for example, if the ID is 1, the board responds to DMX channels 1 through 49. If the ID is 49, the board responds to DMX channels 49 through 97. Test pattern via DIPswitch: fade up all channels to 100%, then chase all channels, then repeat. Very handy for debugging installations. High-resolution (16-bit DMX) mode yes/no via DIP switch. LED connection headers are a unique "pluggable" design: they can be unplugged from the board, wires added/removed, then plugged back in. They can be plugged in two ways: such that the wires exit up out of the board (shown in in picture) or more conventionally parallel to the board. This allows for much easier installation and for moving installations, since the board and the LEDs are easily separated. Board electronics runs from 6-15V DC @ 125mA with LEDs off and 1200mA all-on, reverse polarity protected. Contact me if 75% or more LEDs will be full on for more than 30 seconds at a time and you are using more than 9V, as there are thermal concerns. A regulated power supply is suggested; cheap "wall-wart" supplies typically output several volts higher than their specification, so a garden-variety "12V" wall-wart may put out 15V or more. This may damage the board. Feel free to ask me about suitable power supplies or how to tell if yours will work safely. For operating Solid-State Relays, please inquire. digikey.com 365-1484-ND and 425-2402-5-ND are examples of SSRs that can be directly switched. (For existing customers looking for Version 1 information, go here). Since this board is intended to be installed in an enclosure with other equipment, and wiring requirements are highly dependent on the installation, there is no case provided and the DMX connection is with a terminal block instead of a bulky 3 or 5-pin XLR. See wiring diagram below for details. The basic operation is that this board switches the negative of your LEDs to the power supply's ground. This is called low-side switching, and is the most common way things like this are done, since it is simpler, cheaper, and a little more efficient than switching the positive of the LEDs (called high-side switching). The wiring diagram is here. Turn off the LED power supply, and set the board DIPswitches to: Hires OFF, Testmode OFF, Terminate OFF. Connect the power supply to the board. Turn on the LED power supply. You should see the status LED blinking green slowly. If not, check that at least 6V is present on the (+) relative to the (-). Turn off the LED power supply, and wire a LED: the LED anode goes to the power supply, and the LED cathode goes to the board, use channel 1. Turn on the LED power supply. The status LED should blink slow green. Now turn the Testmode to ON. Your LED should fade up to 100%, then flash and go dark for a few seconds, and then repeat. The status LED blinks red/green rapidly. If your LED does not light, check the wiring and the LED polarity. At this time, you're ready to wire! I don't have a good solution for how to combine all the LED anodes (+) together; you can use multiple wire-nuts, or get a multi-position terminal block and wire all its pins together, or strip 8" of wire and solder the LED anodes (+) to it. I've done it all these ways and others. If you've got something handy, please let me know. I suggest wiring a half dozen or so channels and verifying operation with the "Testmode" DIPswitch at this time. 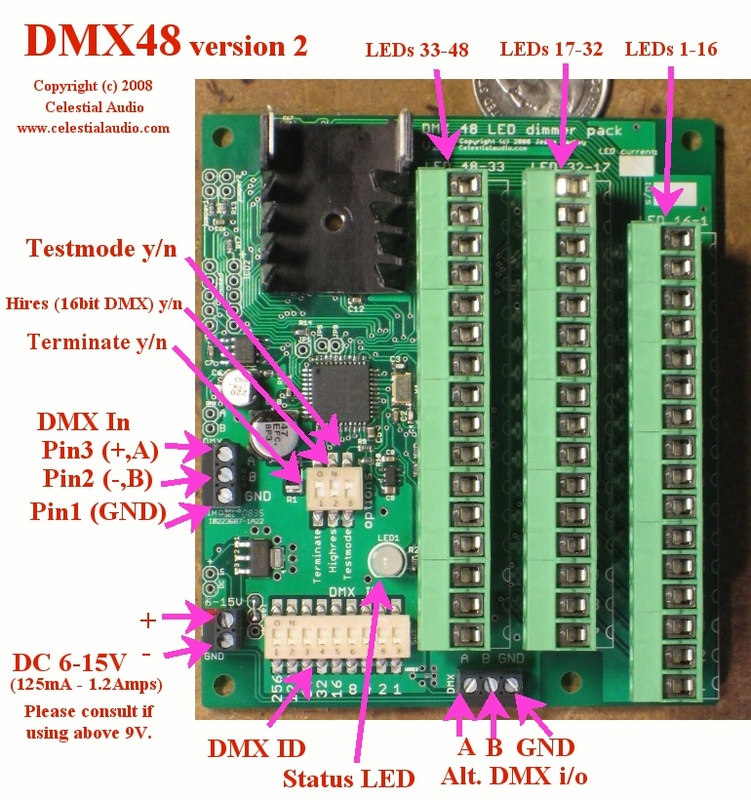 On to DMX: set the "Testmode" DIPswitch to OFF, choose the DMX start ID (suggest 1) and set the 9-position DIPswitch for it (for help with decimal to binary go here), and connect the DMX cable to the board. If you have a 3-pin or 5-pin DMX cable, you can cut the end and screw the three wires into the terminal block or use a 3 or 5 pin to wire pigtails adapter - I normally have a few for $15. Either of the two DMX terminal blocks can be used, there are two for wiring convenience for multi-board installations. Flip the "Terminate" switch to ON, and plug into your DMX source and turn it on. The board status LED should be flashing fast green. If it is red (meaning garbled data): the pin 2 / pin 3 is likely backwards or something is loose. If it is slow green: no DMX is seen; double check the wiring, that pin 2 / pin 3 / GND is correct, and that your DMX source is outputting data. Now for the fun part: if the DMX start ID is 1, and your DMX source is outputting data for channel 1-48, you should be able to fade up and down your installed LEDs. If there is a lot of flicker, check the DMX wiring; if one wire is loose there will be lots of bad data. If the fade up/down looks choppy, compare it with the fade up the Testmode does. Some lighting control desks and software don't do smooth ramps; the fade up the Testmode does shows the board's best capabilities. DMX requires that the last (and only the last) DMX device in a network be terminated; please look elsewhere for more details about this. The "Terminate" DIPswitch accomplishes this. The "Hires" DIPswitch is normally OFF. For finest dimming control possible (such as from a computer) this can be turned ON, and the board combines two DMX channels (8bits & 8bits) to create one 16-bit dimming channel so you can set the brightness to 4096 different levels. Price: $189 Discontinued March 2011. To my existing customers: thank you! I will provide consulting & repairs as needed for the years to come. If you need one or two more for some reason, please inquire. To potential new customers: unfortunately I am unable to produce these at a cost that makes economic sense. If you have a large-scale project that these or a variation of the design would work for (i.e. qty 25 or more), please contact me.